The ferry from Incheon had no outside access and with passengers next to me in total festive mood, there were hardly any opportunity for observation! The first day in the afternoon, I focused on the part of the island just east of the main village. With cloudless blue skies and not too high temperatures, there were few passerines but there were a decent number of Brown (~30) and Tiger Shirikes (~12). 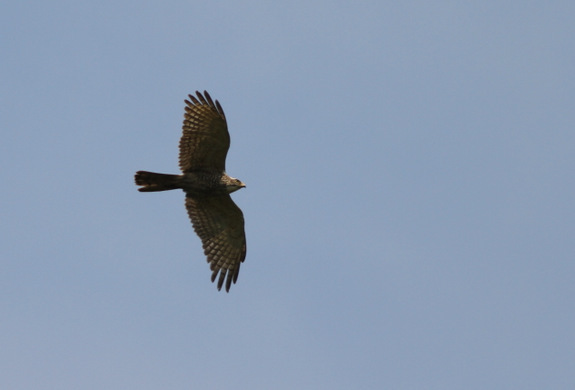 Raptors like Eurasian (~8), Chinese Sparrowhawks (~5), Eursian Hobby (~3) and Grey Faced Buzzard (1) were patrolling the skies as their prey refused to come out of the vegetation cover. Partly to escape from the blazing sun and partly to get a closer look at the warblers and flycatchers, I ventured into the undergrowth and sat motionless for 10 minutes. At first there was not much activity but as the birds were accustomed to my presence, they ventured out to feed and play. Particularly interesting was a Dusky Warbler and an Ashy Minivet that came so close that I could see their eyelashes with my bare eyes! As sunset approached, I walked over to the North Point. 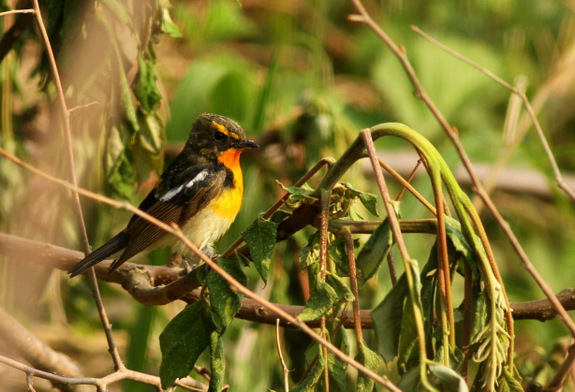 Interesting species here include a gorgeous male Yellow-rumped Flycatcher and a Rufous-tailed Robin. There were also at least 3 passing Chinese Sparrowhawks. 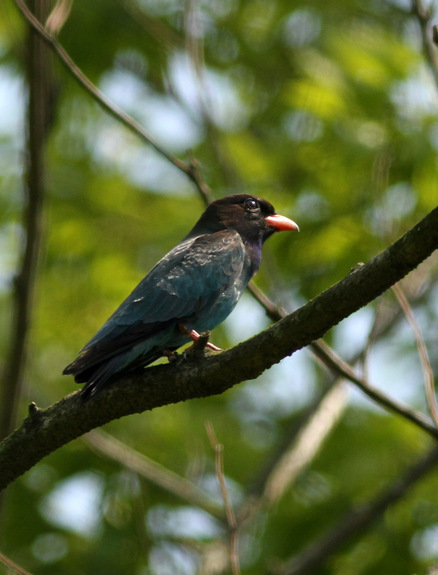 While returning to the Minbak, I spotted a Red-billed Starling on one of the electricity poles. The whole day spent walking across the island starting with the western section of the island in the early morning and noon. 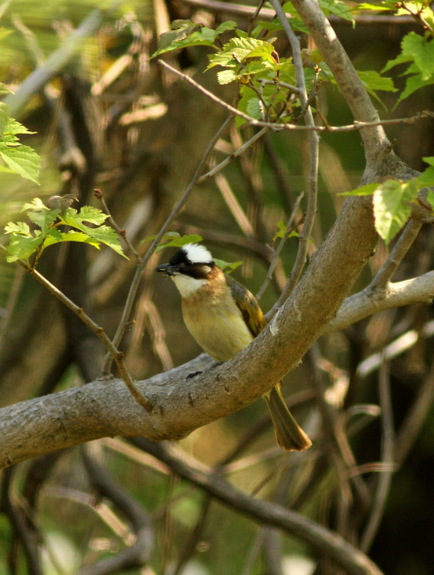 I spotted a Chinese Grosbeak (a lifer for me) on the road to the 2nd village, at least 5 Eurasian and 2 Chinese Sparrowhawks on the road to the lighthouse. Between the radio tower and the lighthouse, a couple of Peregrine Falcons were probably guarding a nest and went absolutely crazy as I walked down the road. At the lighthouse, I spotted newly arrived Meadow (~5), Little (~2) and Chestnut (1) Buntings, as well as a Light-vented Bulbul. 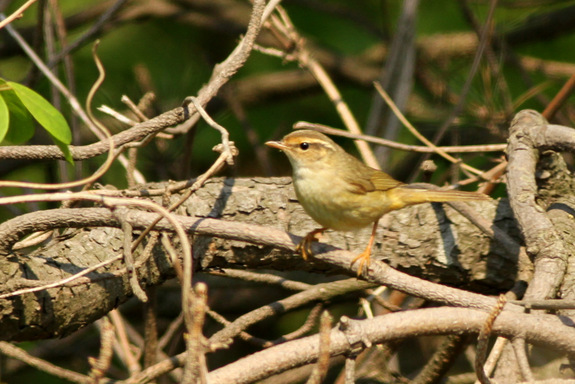 There were a number of Korean Bush Warblers calling in the gully but none of them could be seen even after sitting patiently in the bushes for more than 30 minutes. 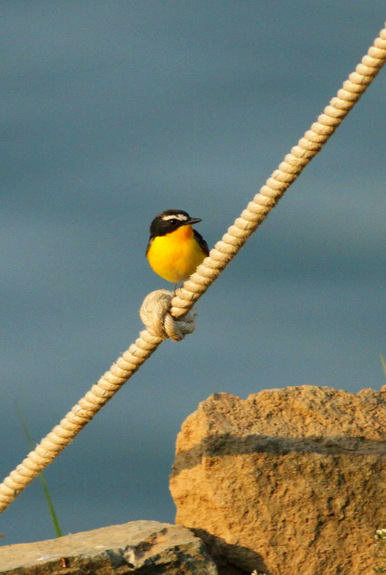 On the way back, there were a lot Arctic Warblers along with a few Radde’s Warblers, a flying Richard’s Pipit, a distant Black Kite (with a small animal in its talons), 1 female Blue and White Flycatcher and a female Mugimaki flycatcher. In the woods just east of the village, there were Pechora Pipits (2), a Great Spotted Woodpecker (heard drumming) and best of all, a brilliant male Narcissus Flycatcher with cobwebs in its head. North point this day in the afternoon was virtually deserted except for a few Grey-streaked Flycatchers and a couple of Oriental Greenfinches. Early morning at the North Point didn’t produce anything interesting. The same with the valley just east of the village. 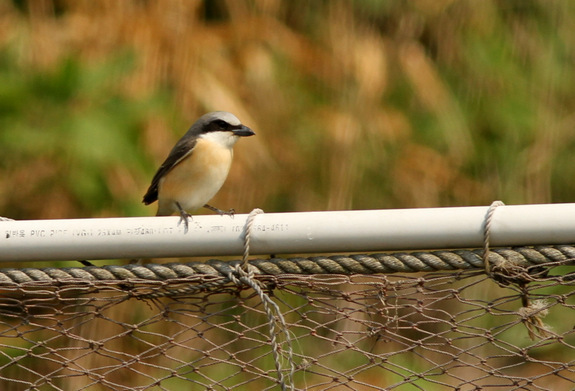 New species for the day was a White-cheeked Starling and more shrikes – Brown (~10) and Tiger (~4). The last hour was spent on the ridge on the south east section of the island (thanks to an obliging army office) where there were Blue Rock Thrushes (~7) and a Striated Heron. On the ferry back to Incheon, there was a single Ancient Murrelet, distant views of probable Streaked Shearwaters. Just outside Incheon, close looks at a Little Tern and 2 Saunders’s Gull.